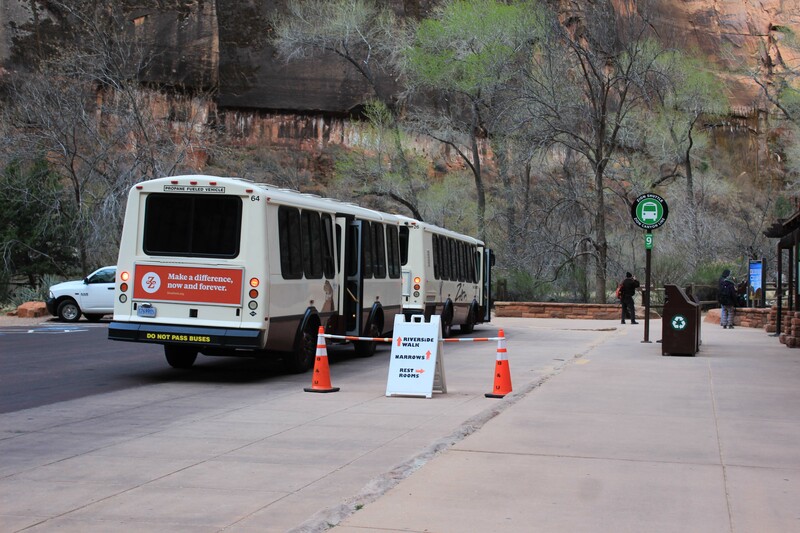 Zion is the fifth most visited National Park in the United States, but is relatively small, and the pressure of the crowds has forced the park to a shuttle system during the peak months. 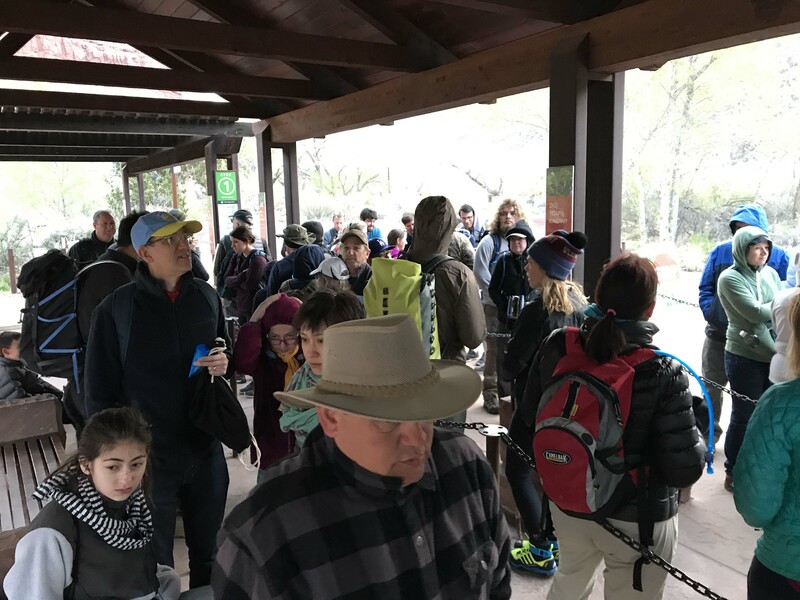 In general we are not a fan of shuttle buses, but we do understand the need, and if you want to see certain things in certain parks you need to use their system. 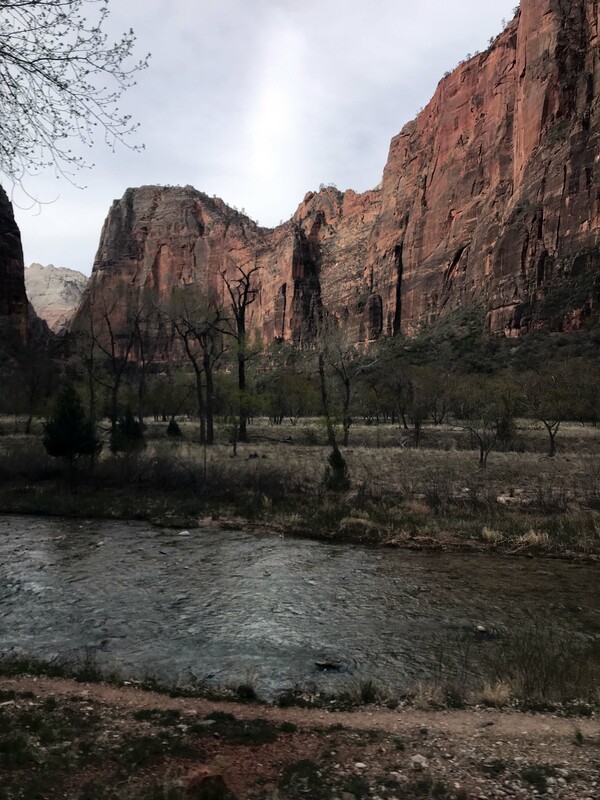 After seeing the long lines (two hour waits by noon), we were even less enthused, but neither one of us wanted to leave Zion without experiencing that end of the park. So when we woke up early on Wednesday, we decided to bite the bullet, get dressed, and head towards the park. Part of the reason we weren’t excited is it is cold in the desert before the sun comes up. It was 42 degrees on Wednesday and we knew we needed to layer up, but also didn’t want to be carrying heavy coats throughout the day as it warmed up. Lee and I both decided on wearing a fleece and I added gloves and earmuffs, which I was exceedingly grateful for once we got out of the truck. We were taking the advice of a ranger at the visitors center and starting at the end of the the route and working our way back, and it was very windy on the canyon floor. I also was excited about trying out my new hiking pack and was thrilled when that worked beautifully. Over the last three years I have tried numerous packs, but found that the weight of the pack and the camera on my shoulder always gave me a back ache. 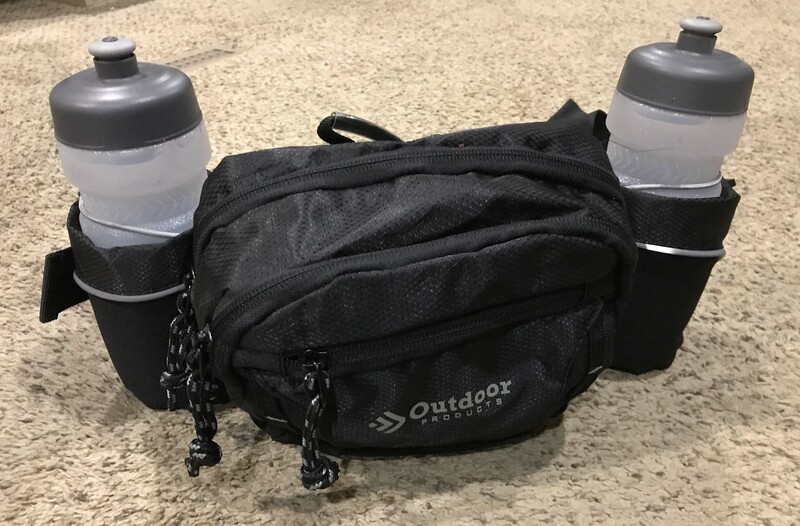 This Outdoor Products H2O Mojave Waist Pack rests solely on the hips and lower back and is big enough for two water bottles, my long camera lens, and snack bars. I was extremely happy with it and compared to others I have purchase it was relatively inexpensive. Geared up, we left the rig at 6:30am and were surprised when we were stopped by construction traffic for 14 minutes. They seem to be doing the work at night, and we caught the last of it as we tried to enter the park. The good news was the parking lot at the visitors center was only a third full when we arrived at 7:31 am, but there was already a decent line waiting for the bus. Surprisingly, a ton of people fit on each shuttle, and although we didn’t make the first one, we did catch the second and were in the warmth by 7:32am. I will say that if you decided to skip the line and drive up to one of the parking spaces by the first three stops I wouldn’t recommend it. The buses are full coming from the visitors center and unless someone gets off you are not getting on, so I don’t think that saved those folks any time. In line waiting for bus. As you can see it’s chilly. The shuttle bus has nine stops, and we were riding it all the way to the Temple of Sinawava at the end with the intention of doing the Riverside Walk trail. There is some audio information at every stop, narrated by a variety of people, and the heating system on the bus worked great. 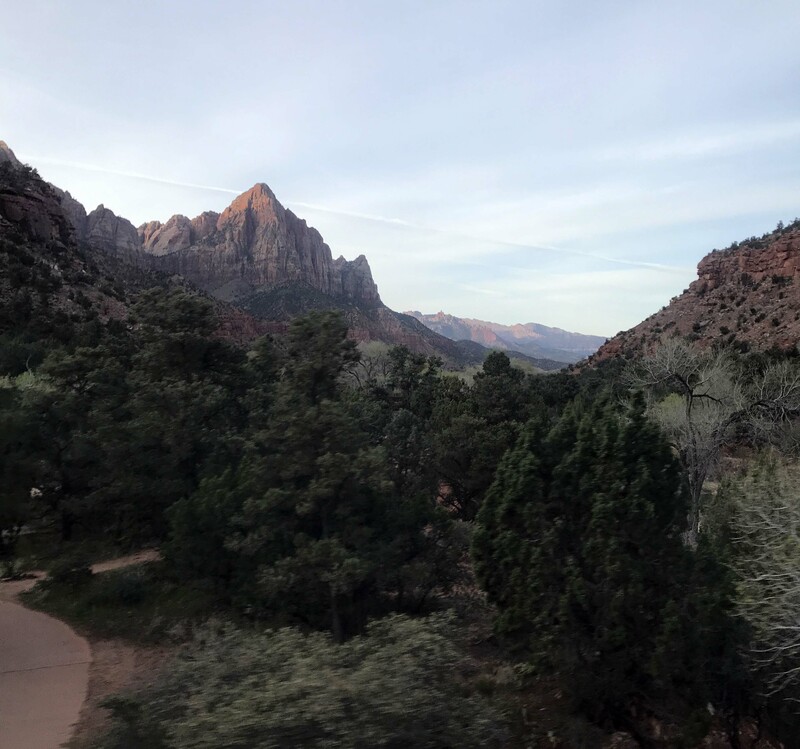 We enjoyed the ride and looking out the large windows, and I would recommend it even if you didn’t want to do any of the hikes. 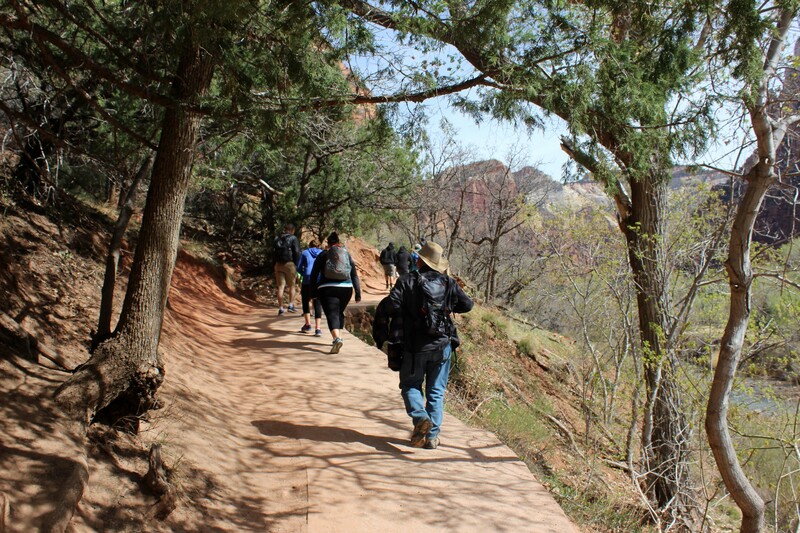 About half of the people (most of the younger kids) got off at Angels Landing, which is a very difficult trail with a 1,488 foot elevation change and steep, narrow drop-offs. 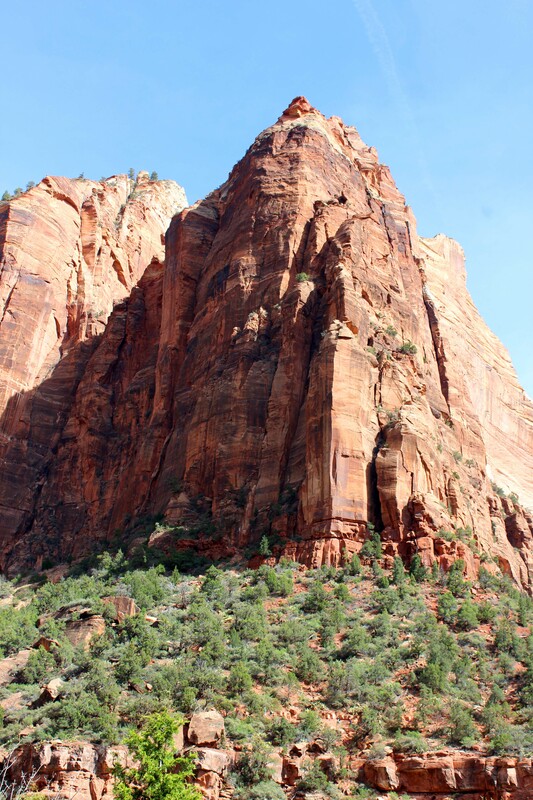 Elevation change is something we pay particular attention to, because neither one of us likes steep hiking. 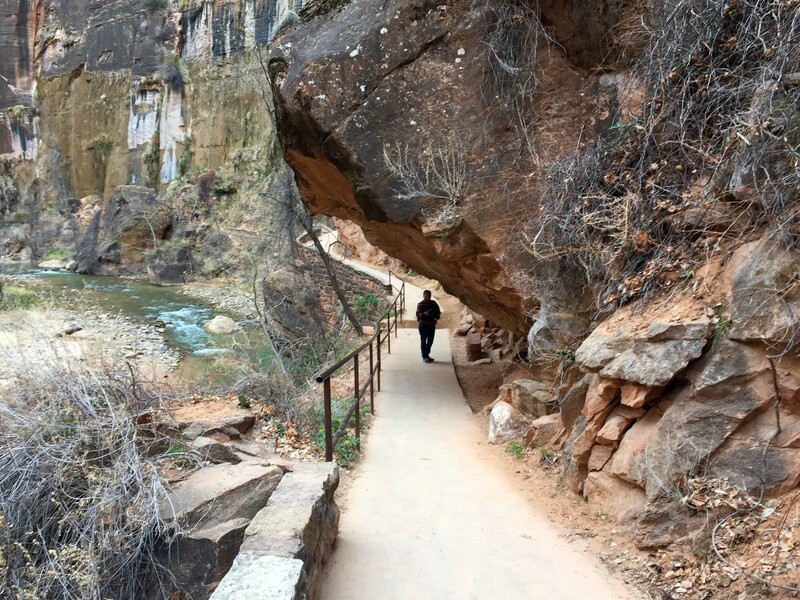 The Riverwalk was perfect for us, because it was 2.2 miles round trip and only had a 57 foot elevation changed. It was also a paved trail and wheelchair accessible which is always a good sign for us. 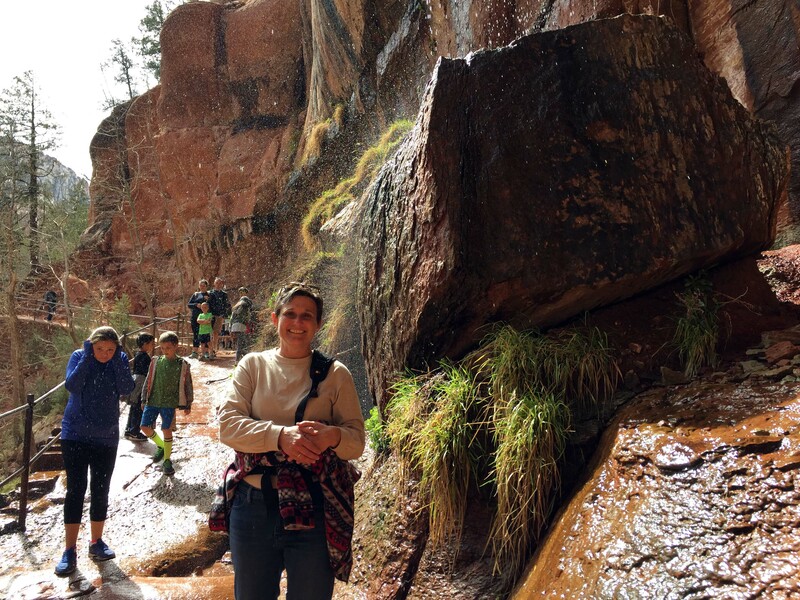 As a general rule we know we can handle any trail that is wheelchair accessible and I like paved trails, because I can focus on the scenery as I walk rather than looking down at my feet. Shuttle buses are double trams and allow people to stand so lots of folks can fit on. 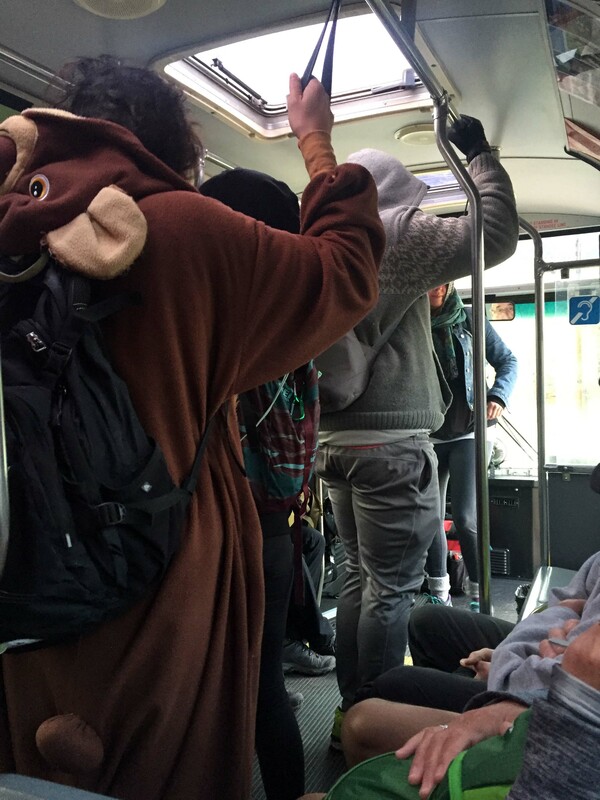 All kinds of serious hikers on the bus that early in the morning, including one very large chipmunk. By the time we got to the Temple, it was 8:17am and the shuttle was only about a third full and we saw several small groups with rubber hiking shoes and wading gear. 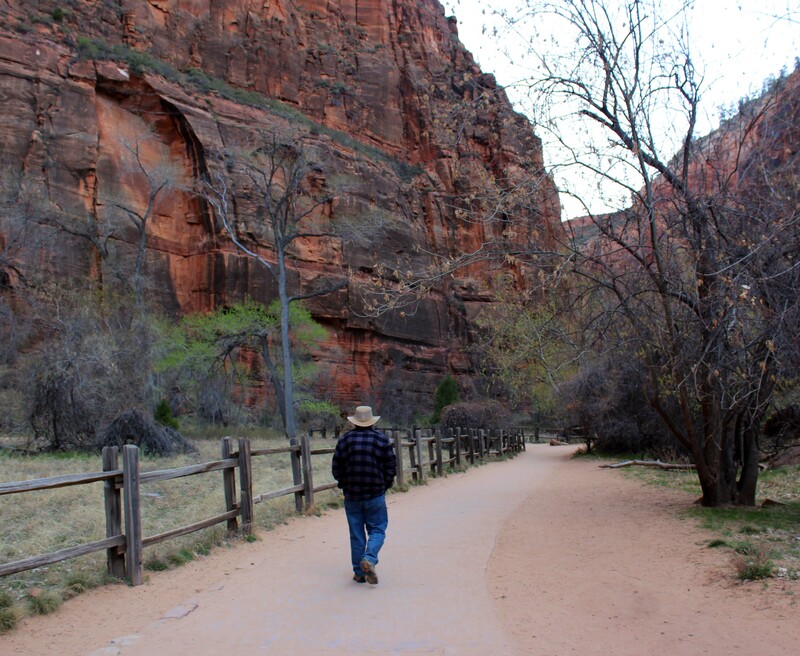 The Riverside walk is the entrance to the Narrows, which is a walk through the Virgin River along the canyon floor. That is a hike I would love to do in the future, because it looked really beautiful, but you definitely need special gear before you attempt it because the water is very cold. One of the nice things about the River walk is it has a little bit of everything. 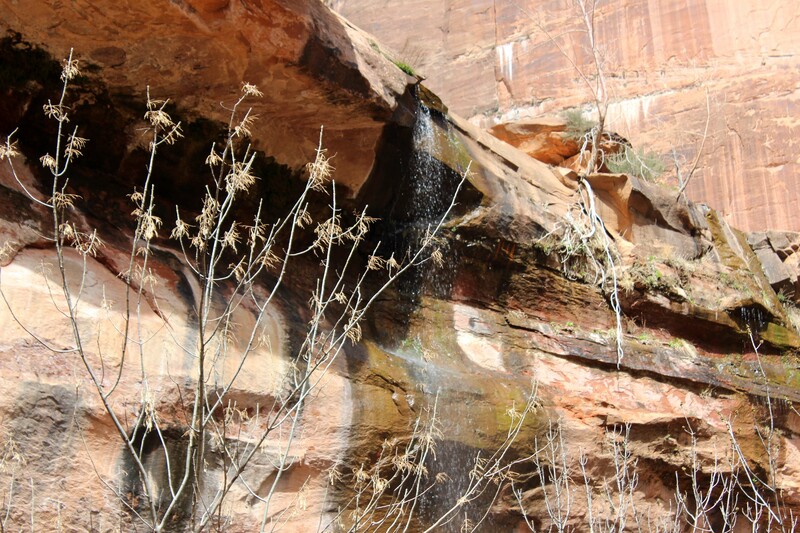 There are some small hanging gardens, being in a canyon, and a walk along a beautiful river which had some small waterfalls. We both loved it, and walked out on the paved path and chose to walk along the sandy shore during our return. It was chilly, and I was incredibly grateful for my gloves and earmuffs, but once we got back to the bus, I was able to take them off and leave them off for the rest of the day. 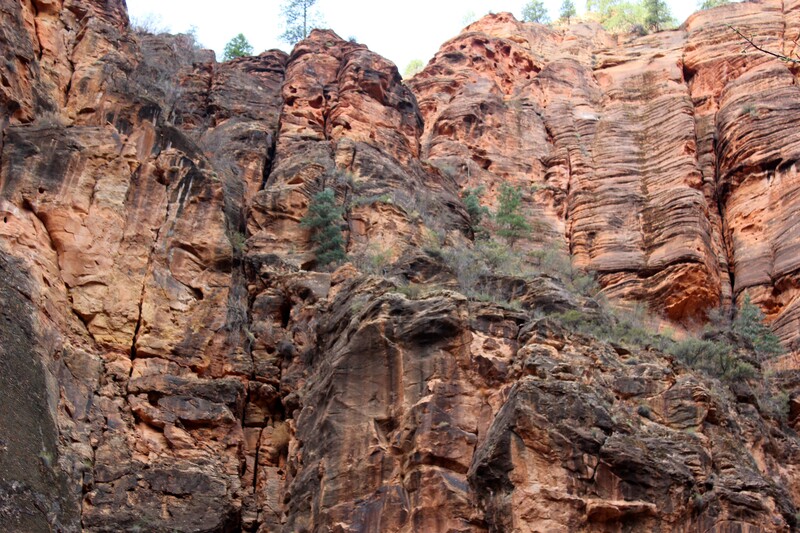 The red cliff walls were gorgeous. 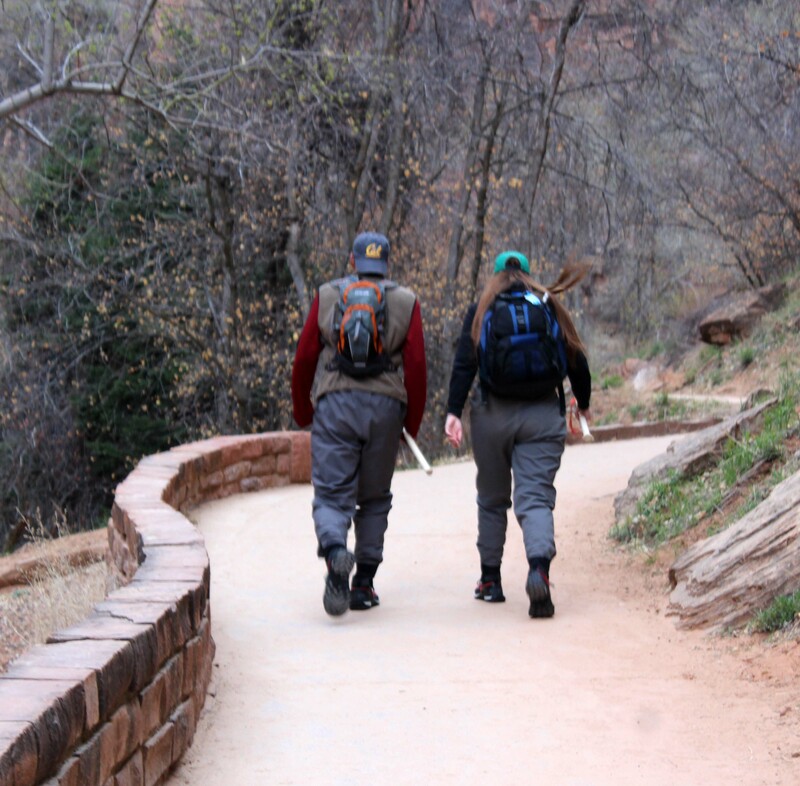 A pair of hikers in their narrows gear. As we started down the path the sun was starting to hit the tops of the cliffs. Lots of small hanging gardens with water running down them. The people in the picture give you an idea of how high the walls were. 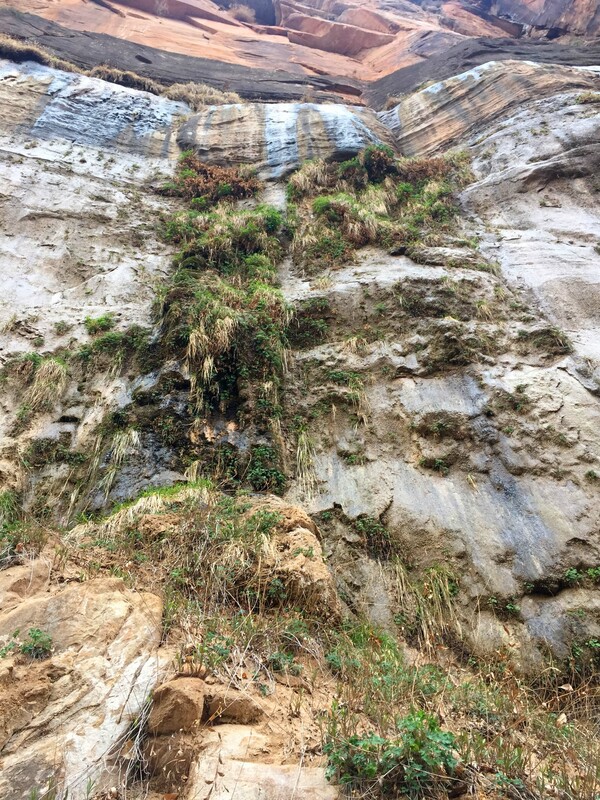 And how close the path was to the cliffs. As the sun came up over the walls they lightened in color. 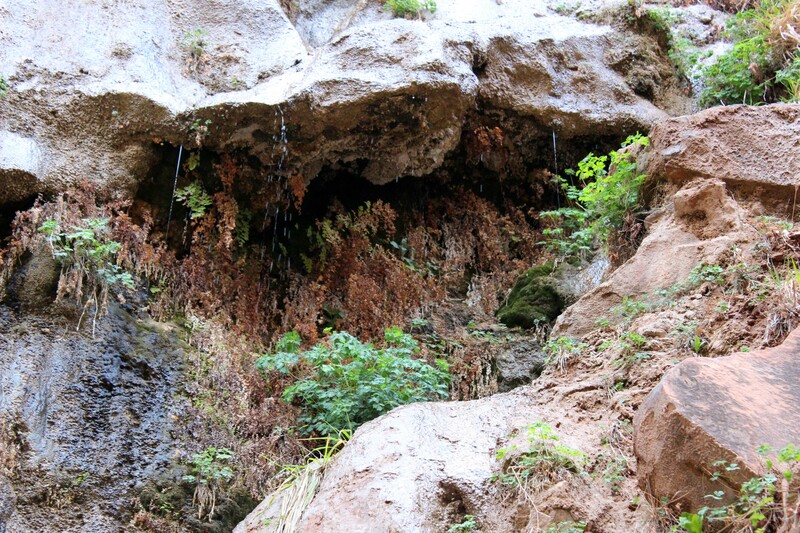 We turned a corner and there were a series of small waterfalls and this gorgeous cave. At the end the path walk down on the rocks (you can stay out of the water) and peek around the corner to get this view of the start of the narrows. That view was so cool, I definitely wanted to keep going. On the way back we left the path and walked along the shore. 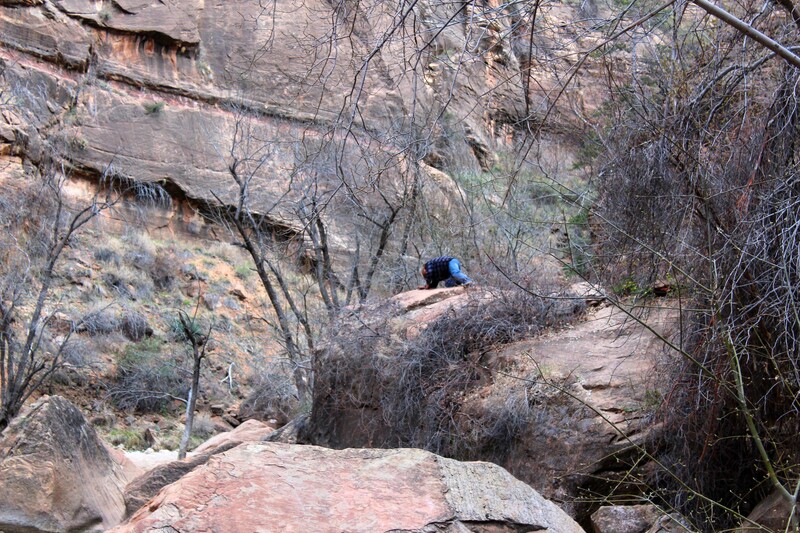 Lee was climbing the big rocks in order to get some video. It was a great hike and I highly recommend it, but we weren’t done yet. Our plan was to stop at most of the stops on the way down and take some pictures, and as advertised it was VERY easy to get a seat on the returning bus. Most of the traffic was going the other way, so we were able to both get window seats and enjoy the view. 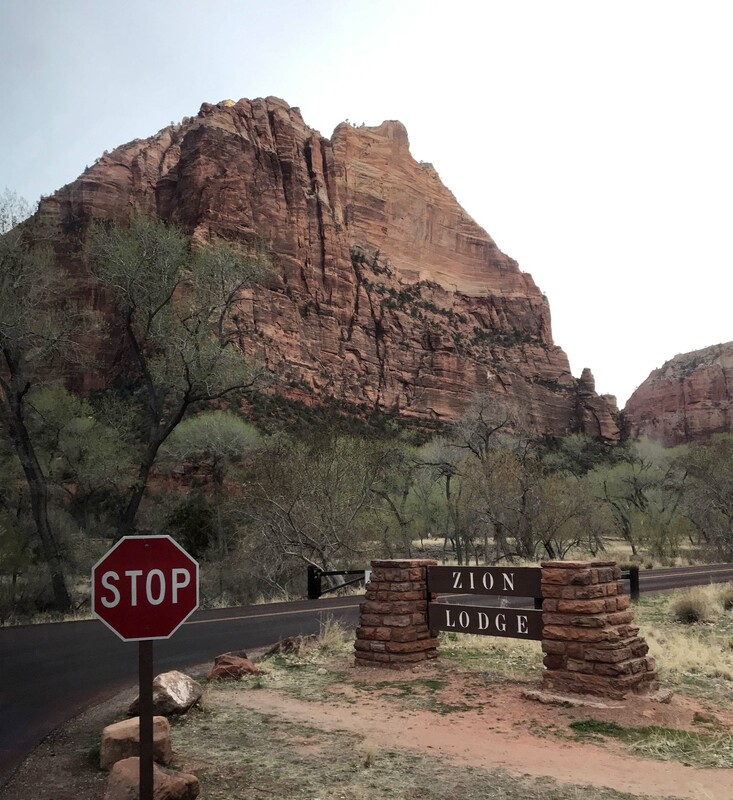 Our next major stop was the Zion Lodge and on a whim we decided to get breakfast. The Red River Grill was almost empty at 10am and the breakfast at $10.75 (eggs, bacon, sausage, toast and hashbrowns) was very reasonably priced considering where we were, and the view. 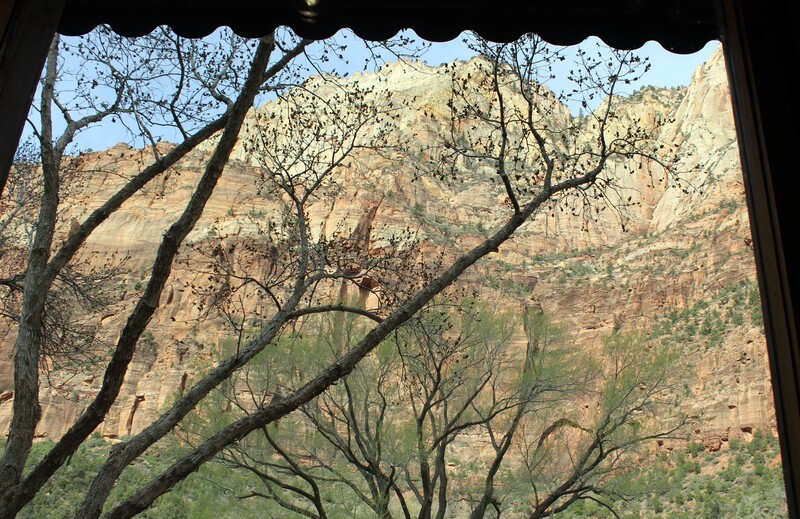 The service was pretty poor but the food was good and we loved the view from our table. The wait staff told us the line was out the door for lunch and dinner, so we were happy to experience it without fighting any crowd. 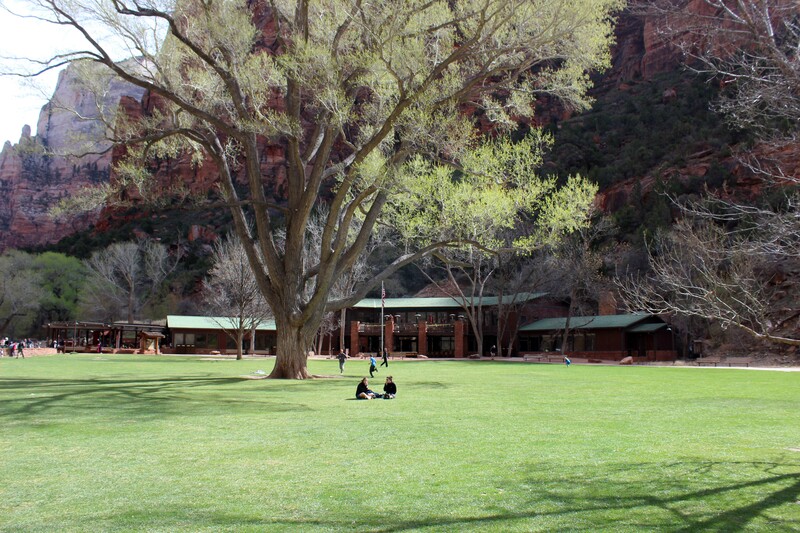 Plus the lodge itself is really pretty, nestled in the rocks, and is the trail head for the Lower Emerald Pool Hike. This huge lawn was great because it gave people a place to eat packed lunches. Really beautiful and nice gift shop! By the time we got on that trail, it was pretty crowded, and despite the 69 ft elevation change it was much steeper than I expected because the trail went up and down several times. Even though it was only 1 mile we were huffing and puffing and between the crowds, steep drop offs, and climbs I wasn’t loving it. Then we turned a corner and everything changed. 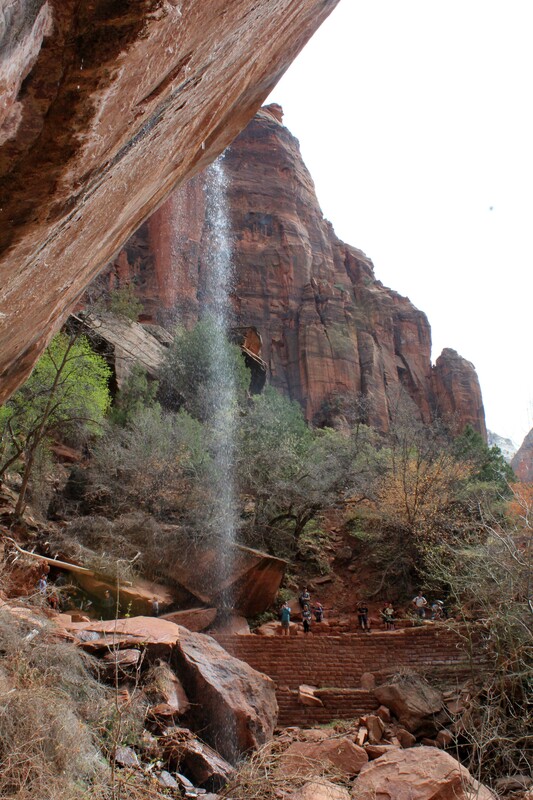 There wasn’t a ton of water flowing down, but it was still very special and had the added benefit of being able to walk under the waterfalls. 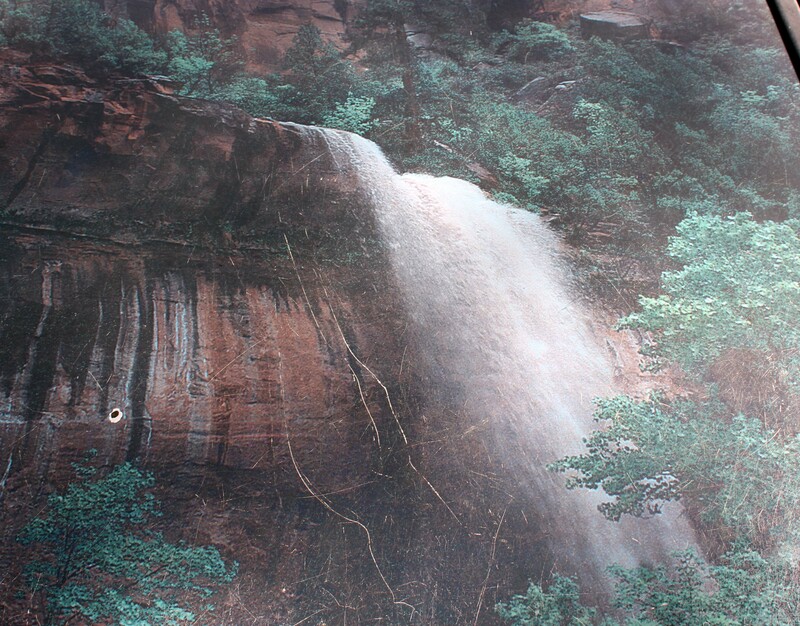 It was a short distance from the lower pool to the middle pool, and that’s where we stopped, and we spent a ton of time taking pictures and enjoying the water spraying on our face. I really really liked it, and it was totally worth the climb. You cross a bridge to get to the trail and if nothing else go to the bridge. This is the view looking upstream. And this is the view looking downstream. 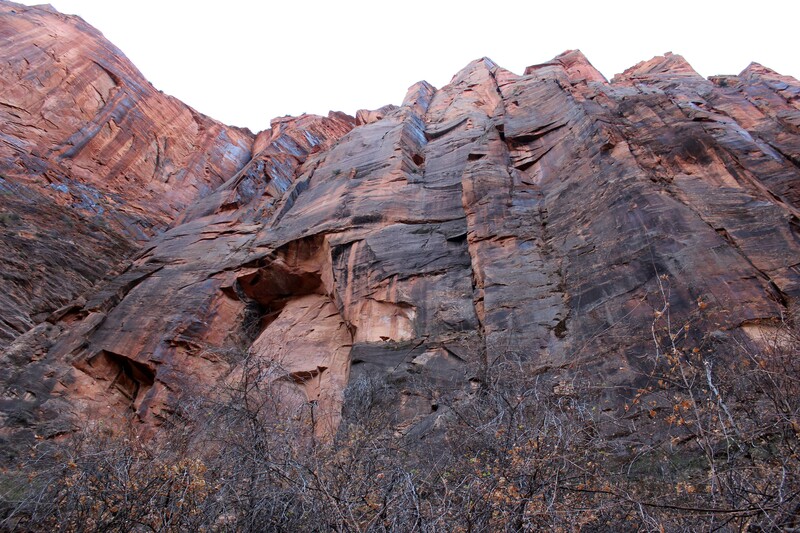 This trail was a little steeper and had some sharp drop offs which I wasn’t crazy about. The views along the path were great though. Much better colors now that the sun was fully out. I wasn’t sure what to expect and initially was disappointed when the pictures showed this. We kept walking though and I am so glad we did, because initial appearances were deceiving. 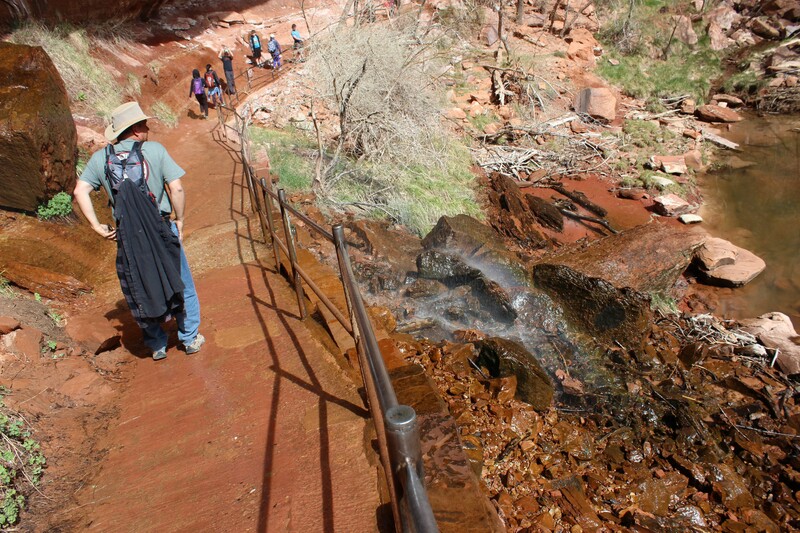 When you walked under and to the other side you realized how much water was actually coming down. Very refreshing on a cool day. And then it was just a short walk to the middle pool which was equally cool. We stopped on the steps and looked back and it was absolutely gorgeous. So glad we made the climb and again I absolutely recommend this. Coming down from the pools was much easier and again we had no issue getting on a shuttle bus. Since the bus was mostly empty we could both take pictures out of the window and many of them turned out really good. 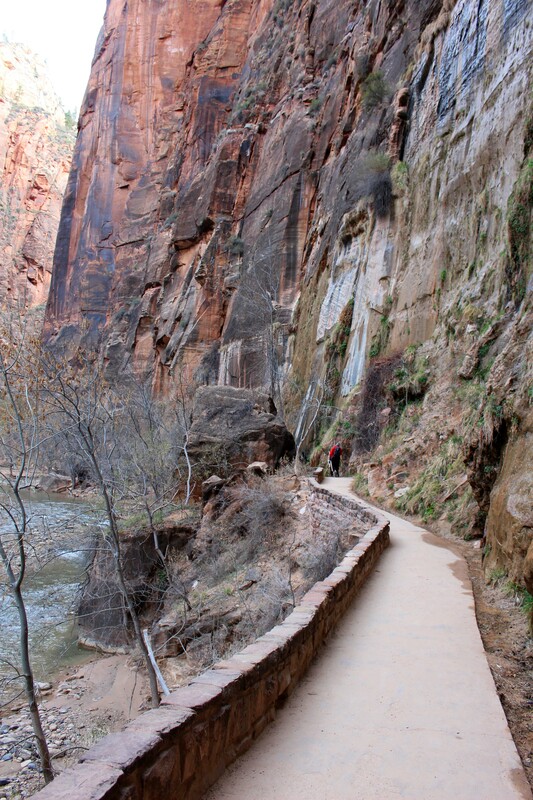 Our next stop was the Court of the Patriarchs and walked up a very steep path to a small viewing area where you can see all three of them. They were named for old testament patriarchs and were really beautiful and I would imagine a great place to watch the sun rise. Another view from the bus. 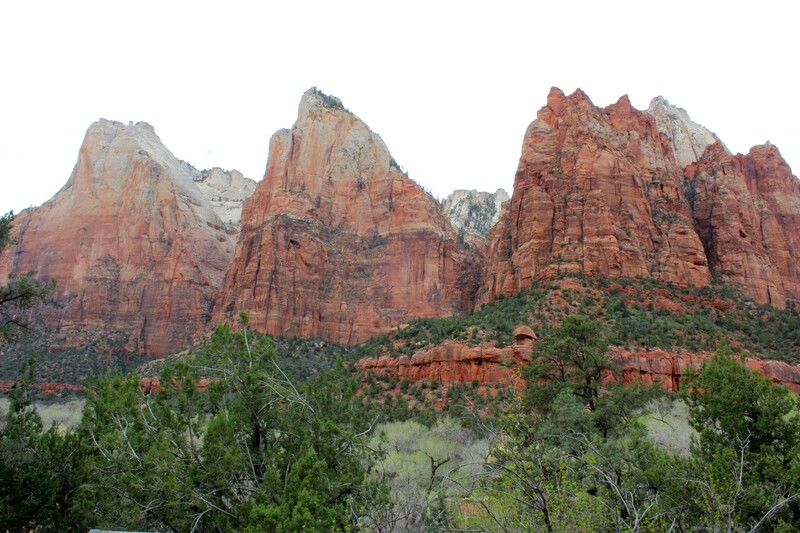 The Court of Patriarchs who were named for leaders in the Old Testament. From left to right they are Abraham Peak, Isaac Peak, and Jacob Peak. Our last stop was the museum, and although the museum itself was very disappointing, the movie was pretty great. It desperately needed a refresh and update to HD but the narration and information provided was terrific. It was 22 minutes long and we were both transfixed as we watched it, Lee and I both agreeing it was nice seeing it at the end of our visit rather than at the normal beginning of a national park visit. After watching the movie we made it back to the visitor center, saw the extremely long line of people just getting started, but it was 1:02 pm and we were done for the day. As tough as it was getting up and going that early and fighting the cold I wouldn’t do it any other way, and despite the crowds and the structure I was very glad we got to experience it! 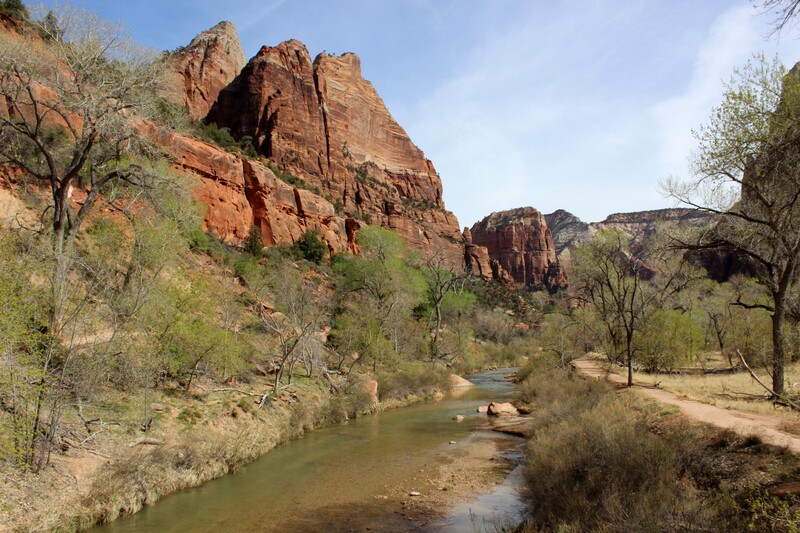 This entry was posted in Lakeside and tagged Court of patriarchs, Temple of Sinawava, Zion Lower emerald pool, Zion Middle emerald pool, Zion Naitonal Park, Zion Riverside Walk, Zion shuttle bus system. Bookmark the permalink. I guess we got lucky, we visited in late March one year, before shuttles were required, so we could drive to the end of the canyon. Photos show us in shorts, and I didn’t remember being cold, but photos also reminded me that even in March, there was a ton of cars, and we did have to hunt for a parking place to hike the River Walk area. 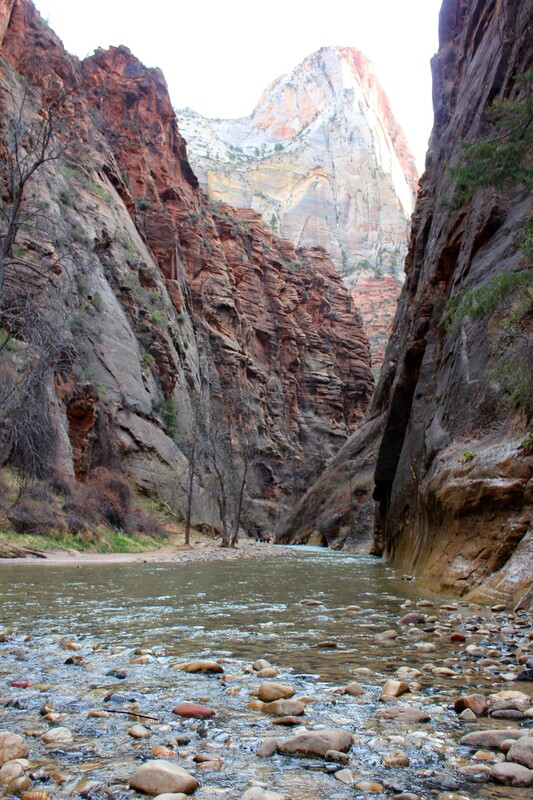 And no, the Narrows is still on the “todo” list, as yet not attempted. We were there Wed also, and did most of the hikes you did. 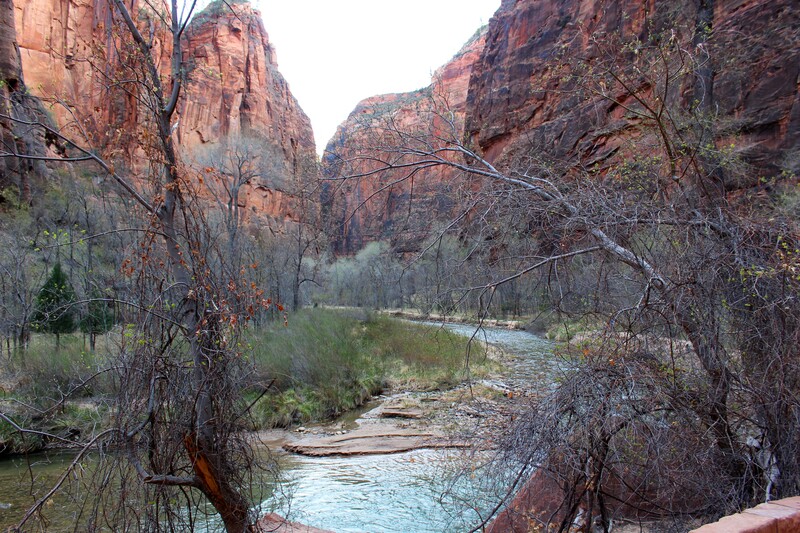 We did the Paria trail along the river also which was nice. 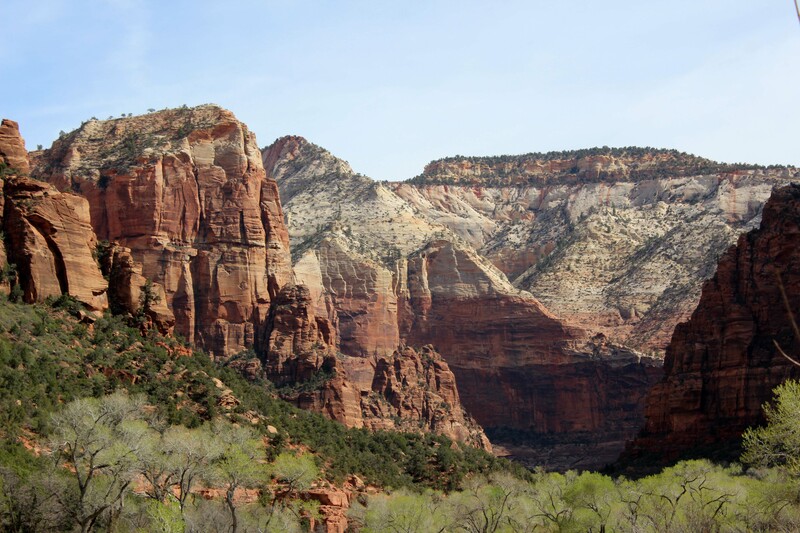 Only one day at Zion because we are stuck in Kanab for a few days while the motorhome has emergency wheel bearing surgery. It was nice meeting you at the reunion rally. Nice to meet you also Mike. So sorry we missed you. I am actually posting in arrears because no way I could keep up with the pace of us seeing things. Sorry about the wheel 😒. That’s a bummer !! Love the video. It’s like doing a meditation – the sound track is just perfect, thank you, thank you. Just…OH WOW!!! What a beautiful place. I know I was there in 1963 with my family, but at 12 years old it didn’t resonate with me the way it would now as an adult. Lee’s video was absolutely perfect. It reminded me of the nature video at the ending of CBS’ Sunday Morning programs. Thankyou. 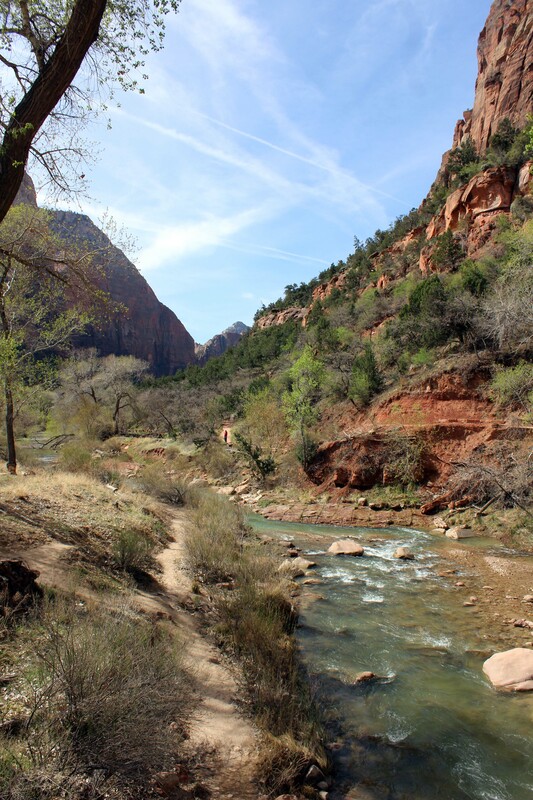 One of the many beautiful parks in Utah. You got a good taste of it. 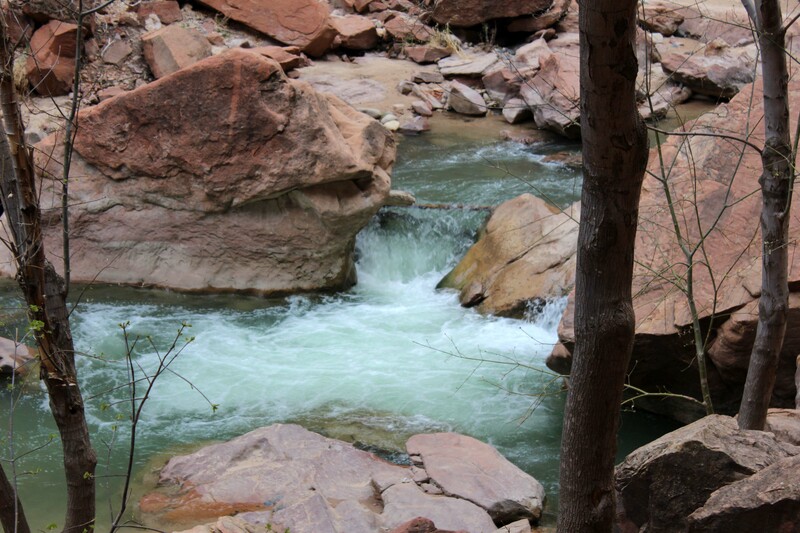 Loved the hiking there! I much prefer my hip pack too for most of my hikes. 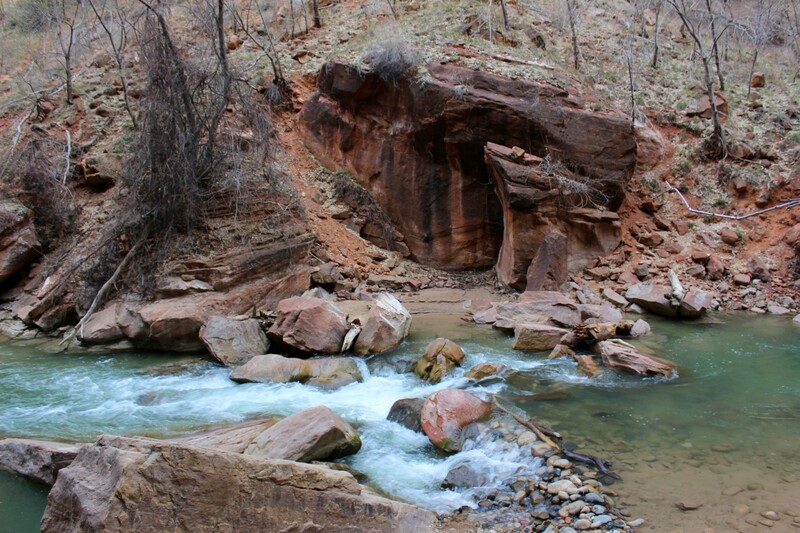 The Narrows is such a fantastic river hike. Would love to do it again, but don’t want to be back in the crowds. Such a pretty area and loved the video. Utah is such an amazing state. Are you planning on seeing Bryce? 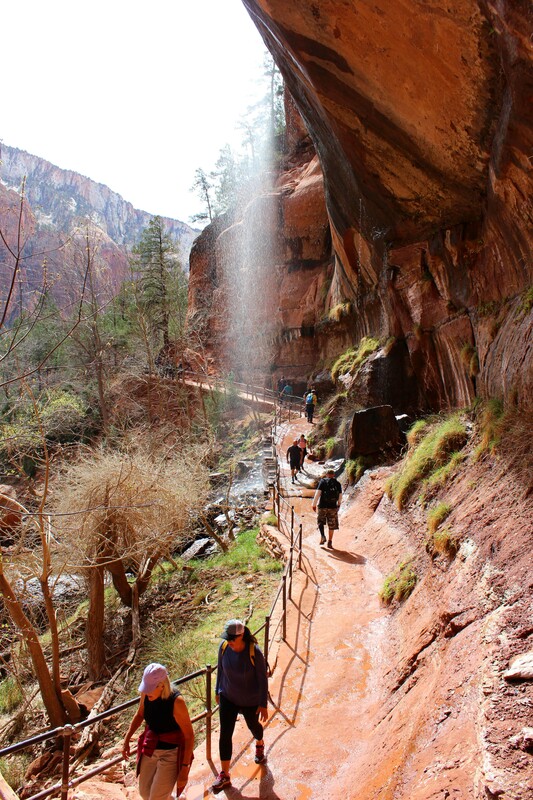 Bill and I did some of these hikes back in 2010, what a great day we had! Loving seeing it through your eyes! Thanks for taking the time to post this. We will be there in late May so I am making all kinds of mental notes. Have fun and safe travels! Your welcome. Hope you find it helpful. Just keep in mind weather has been a big factor in the places we have decided to stay and I am sure it will be much hotter. Great picture’s, I plan on being there this fall. Love the video very nicely done as always “Lee”. Thanks for the pics and the tips. 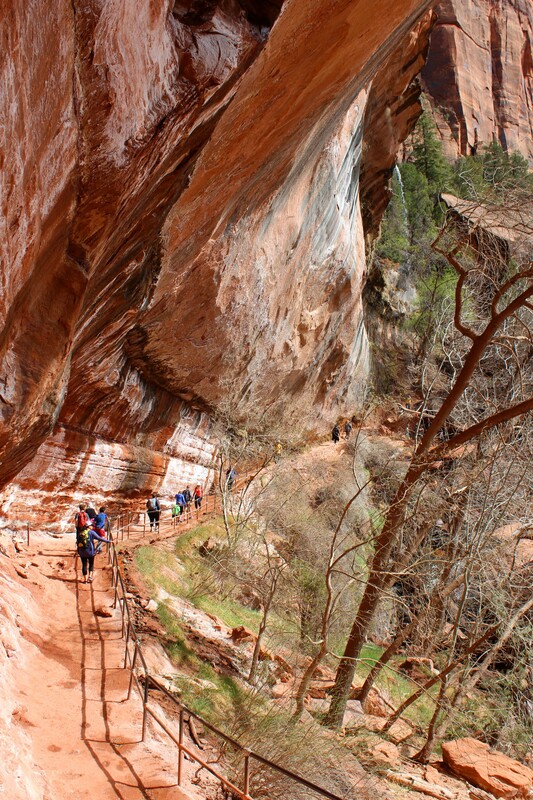 Zion is definitely on the list of “must sees”. I can’t seem to get the videos to fire on the blog though. I went to your YT channel and they play fine. Safe travels.